CHICAGO -- Three speakers at the opening session of RSNA 2017 that opened in Chicago today described the rapidly evolving future of medicine and the role imaging is poised to play. RSNA president Dr. Richard L. Ehman, led the discussion – “Is it Time it Reinvent Radiology?” - with a sober reminder. In the 1970’s if a car accident patient arrived in the ER with symptoms of a head injury but no fracture, the only way to determine if they had a brain bleed was for a surgeon to drill holes in the skull to check. According to Ehman, rapid gains in imaging are characterized by team-led advances and practical applications of discoveries to solve an immediate medical problem. As an example, Ehman, who holds more than 30 MR patents, cited the invention of imaging in 1895. 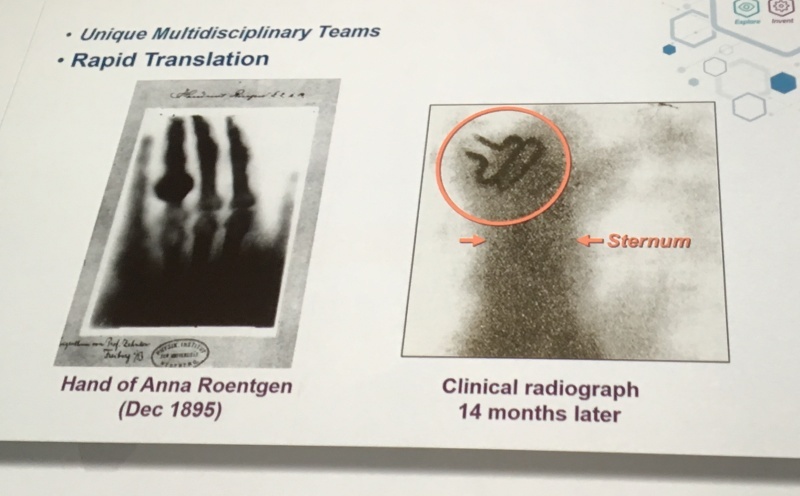 That was the year physicist Wilhelm Roentgen made an image of his wife’s hand using X-ray tubes. The first clinical application of the new technology occurred just 14 months later to find a buckle swallowed by a child. This despite the fact that a prominent surgeon of the day predicted X-ray had no useful medical application. “Imaging relies on a use-inspired strategy with basic science as the most important starting point," said Ehman. He also stressed the importance of patents as a measure of research success, as compared to the NIH emphasis on published articles. He noted a $33 return on investment in downstream economic patent inventions on every $6 NIH investment per $100 million. He also demonstrated a strong correlation between Nobel Prize recipients who were patent holders. Less than two percent of the NIH budget currently funds imaging research, Ehman said. The next two speakers fleshed out the details of how such a future is likely to evolve. Dr. Roderic Pettigrew, founding director of the National Institute of Biomedical Imaging and Bioengineering at the NIH, and chair of a new Texas A&M program to integrate engineering into medicine, offered several examples of radiologists in their evolving role as biomedical data science experts.